With the death of Atal Behari Vajpayee, the Sangh Parivaar has lost its last ‘peacemaker’ who lived in a secular packaging for most of his life. In him, even Kashmir lost a pair of most important ears that had, historically, heard the voices of logic, reason and history, people who know Vajpayee in Kashmir said. While most of the reportage about Vajpayee’s Kashmir involvement revolves around his era as the Prime Minister, the fact is that he was involved on Kashmir ‘front’ for a very long time. Vajpayee as the young Sangh activist had accompanied Dr Syama Prasad Mookerji in 1953 to Kashmir. A watershed event in Kashmir history, Mookerji had come to protest the exclusivity of Kashmir in the Indian federation. Then, the Sangh slogan was Eak Pradhan, Eak Nishan, Eak Vidhan. Sheikh Abdullah arrested Mookerji , kept him in a Nishat house where he died. Sangh termed it custodial murder and it eventually contributed to Sheikh’s humiliating dismissal as Prime Minister and arrest. But Vajpayee’s first major public appearance was somewhere in 1967 or 1968 when as leader of the Jana Sangh, he was supposed to deliver a public speech in Srinagar’s Sher-e-Kashmir Park. The programme had been announced by Tika Lal Tiploo (killed by militants on September 14, 1989), the Sangh’s leader in Kashmir, operating from Haba Kadal, then the main address of the Kashmiri Pandits. Qadri remembers that the procession – not initiated by the Plebiscite Front though – was shouting slogans in favour of the referendum and was fiercely against the Jana Sangh. That hate against Jana Sangh had two vital factors. Firstly, the Parivaar opposed the idea of special provisions that Kashmir enjoyed post-accession and its bitter opposition led to the sacking of Sheikh, one of the towering leaders of the Vale. 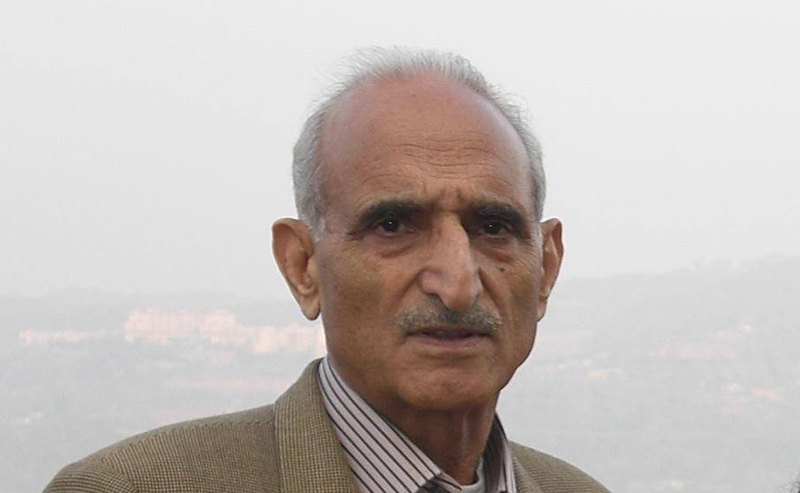 Secondly, the Jana Sangh had a very communal face in Kashmir, Balraj Madhok, who lived in Kashmir, fled to Jammu in 1947, and literally gave birth to the new Jana Sangh that had most of its politics rooted in Kashmir. 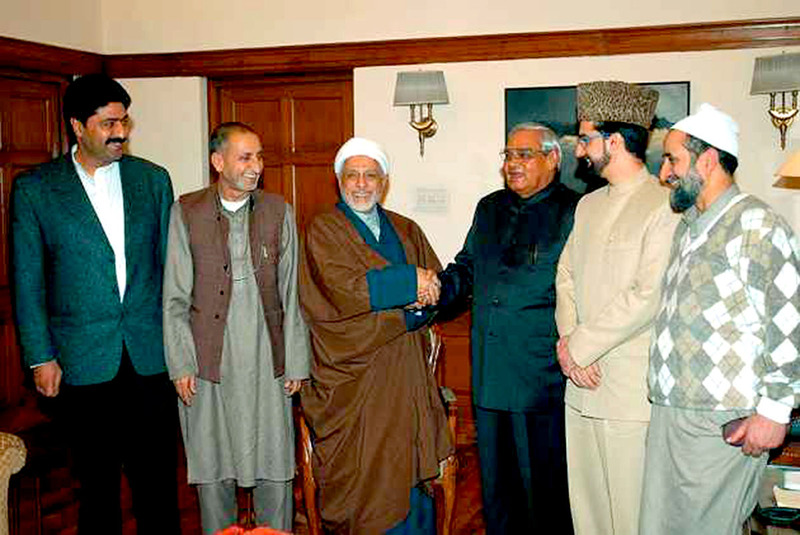 A file pic of Atal Bihari Vajpayee with Hurriyat delegation in New Delhi on January 23, 2004. “We reached the spot and very close to it we saw the audience comprising mostly of Kashmiri Pandits,” Qadri said. “As the students attempted getting into the park to disturb the meeting, it ended into a clash.” The students resorted to stone pelting. “It disturbed the entire meeting and the audience fled,” Qadri said. “Then the leaders on the stage were targeted and we were told that Vajpayee survived with an injury in his leg.” Police came into action, chased the students away and rescued the leaders including Vajpayee. But that attack did not deter Vajpayee from speaking. He walked to the Orion Hotel in Lal Chowk and an emergency press conference was organised on its top floor. Mohammad Sayeed Malik, then a young reporter, covered that presser. Post-emergency, India changed. It was Jana Sangh propelled anti-emergency political voices, which created Janata Party that managed to get power in 1977 polls. By then, Congress had rehabilitated Sheikh Abdullah in Kashmir and restored him his throne in 1975. But when the emergency was declared by Indira Gandhi, it was extended to Jammu and Kashmir as well and Sheikh resorted to massive arrests of Jamat-e-Islami in Kashmir. Janata Party had an appeal in Kashmir too. All of a sudden, a section of non-Congress, non-NC people started finding a space in the Janata Party. Vajpayee had already become the External Affairs Minister and started working overtime in Kashmir. Later that year, Jammu and Kashmir went to polls after Delhi made it public that it will not permit any rigged election. This public commitment helped all the anti-NC forces get reactivated: Moulana Mohammad Sayeed Masoodi was the main leader of the Janata era; Mirwaiz Mohammad Farooq was the most prominent ally; Abdul Gani Lone was also around and Jamat-e-Islami also contested polls. Sheikh being a reluctant Congress ally, even after the loss of power, Janata Party wanted to see him defeated. But the free and fair elections, perhaps for the first time after 1947, fetched Sheikh a stable government. The National Conference (NC) won 47 out of 76 seats in the state assembly – 40 of them from Kashmir. Janata Party won 13 seats – only two from Kashmir – Abdul Rashid Kabuli (Eidgah) and Abdul Gani Lone (Handwara). Jamat-e-Islami got five seats. Kabuli became the Janata Party’s legislative party leader. 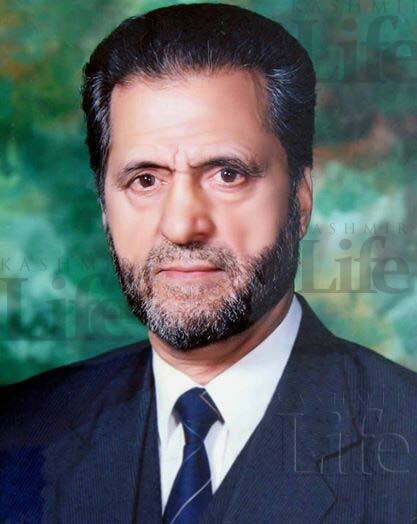 “Mirwaiz had fielded another candidate but he lost to the NC,” Unjum said. The most important thing that Kabuli revealed was that Vajpayee was “unhappy with NC and Congress” and was repeatedly insisting that the two parties have “destroyed” Kashmir. “Not once but many times he asked me that I should get in and create a party but I always maintained that I lack capacity and resources and I do not want it,” Kabuli said. “I believe, it was the same offer that Mufti Mohammad Sayeed later availed and created his PDP.” Was that the reason that the part went lock, stock and barrel to pay their respects to the departed Bishmpidama of Indian politics? It is public knowledge though that Vajpayee’s rubble rousing speech on the eve of the demolition of the Babri Masjid in December 1992, was a key factor in creating a mess that eventually led to Godhra in 2002. “There were sharp stones that came out, no one can sit there,” Vajpayee had famously said while telling a jubilant audience that they have been waiting for a long time to sit in Ayodhya. “The ground has to be levelled; it has to be made fit for sitting.” He had been accused of making a similar speech in Nillie in November 1983 when his anti-Muslim diatribe led to the butchery of nearly eight thousand Muslims in seven Assam villages within 24 hours. But Kashmir being different, Vajpayee always saw it in its historical context, or, as Kabuli said as “a completely separate and distinct culture”, unlike the entire Parivaar. 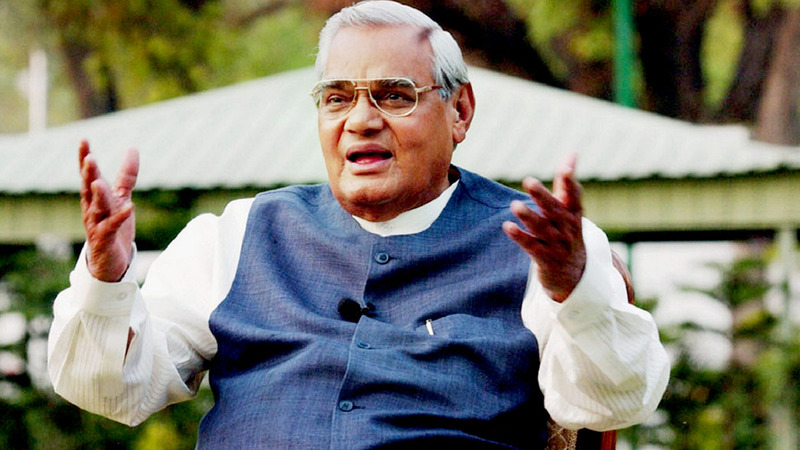 As Prime Minister, Vajpayee’s initiatives are well documented, but not all of them. “Vajpayee was indulgent towards Kashmir,” Dr Haseeb Drabu, the man who inked the BJP-PDP deal for Mufti Sayeed in 2015 winter, said. 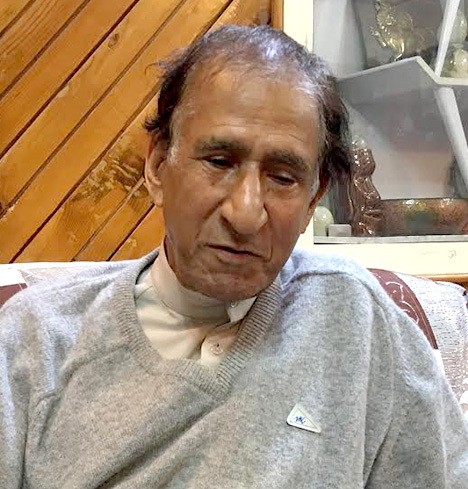 “While his troika of Insaniyat, Jumhooriyat and Kashmiriyat was more of atmospherics, even as it set the framework for a possible approach, it was evident in smaller cases that I personally know.” He had accompanied Mufti when the latter went to see Vajpayee, after the accord but found him “barely alive”. They had breakfast with his adopted daughter, instead, and flew home for oath-taking. Drabu was personally involved on three occasions with Vajpayee as the Prime Minister. “The first came within days when we were drafting the plan and I evaluated that Jammu and Kashmir needs Rs 2500 crore,” Drabu said. “As I finalised the requirement, I was conveyed that the Prime Minister wants Rs 2600 crore. When I said the state does not require, I was rebuffed and overruled but finally, the Chief Minister wrote a letter, thanking Vajpayee for being gracious but kept the figure at Rs 2500 crore.” As the file reached Vajpayee, he summoned him. “He understood my logic and then said, let us have all the Rs 2600 crore spent on your terms,” Drabu said. In April 2003, when Atal Bihari Vajpayee said the talks with Pakistan would be held within the ambit of Insaniyat. The crisis landed Darbu flanking his Chief Minister to the PMO. 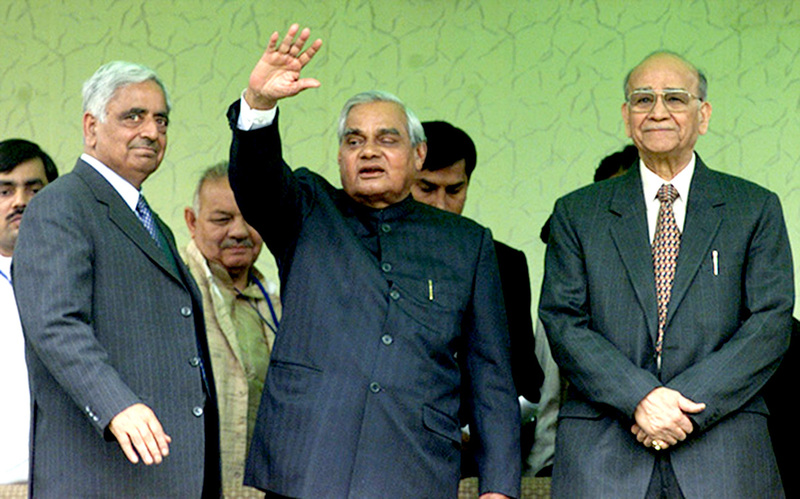 Vajpayee offered double the sum outside ADB. “I said, Sir, we do not need this money for the sake of resource, we seek it because the World Bank funding comes with the systems that we want to build and he felt convinced,” Drabu said. “The next moment, he picked up the phone and told Yeshwant Sinha to sign it. The benefit was shared by J&K and PaK just by his nod.” Muzaffarabad got more than Rs 2500 crore. Malik said Lone would drive in one car to his Observer office and from there he would move in a different private car, just to maintain some sort of secrecy to what he was doing. He later went to Pakistan and Vajpayee knew every bit of it. When he flew home, he was killed. Vajpayee had visited Kashmir many times as Prime Minister but his visit in May 2002, was overshadowed by the assassination. In his statement that was distributed to the media persons, Vajpayee termed Lone “a respected figure, a great son of Kashmir and spirited champion of Kashmiriyat”. Lone, he said, was gunned down by the “enemies of peace” because of his “courageous voice against gun culture, a voice that was beginning to get more and more influential”. For formal “talks” with Hurriyat took off much later.